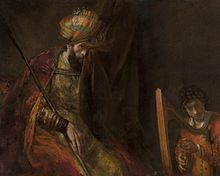 David Plays the Harp for Saul, bi Rembrandt van Rijn, c. 1658. Accordin tae the Ebreu Bible, Saul (/sɔːl/; Ebreu: שָׁאוּל, Šāʼûl ; "asked for, prayed for"; Greek: Σαούλ Saoul; Laitin: Saul; Arabic: طالوت‎, Ṭālūt) wis the first keeng o a unitit Kinrick o Israel an Judah. This page wis last eeditit on 10 November 2018, at 15:30.